The judges are back, in their white coats and holding their clipboards. You just better hope the contestants don’t sweat. It’s back. The World Championship Cheese Contest has returned to Madison this week for the 2018 duke-it-out between some 3400 Goudas, Cheddars, Blues and more, including some yogurts. If you’ve never attended this Olympics of Dairy Products, it’s a serious, silent and sometimes smelly competition. But unless you’re in the stinky cheese area, the most unnerving part of this biennial contest might be the spitting. No, it’s not between angry fans from rival cheese camps. It’s the judges…who can’t possibly swallow all the cheese they have to taste. So, they taste…and then they don’t swallow. It’s weird but if you had to keep a clean palate between tasting your contestants, you’d have to spit too. Or have some serious gastrointestinal challenges later. Fortunately, there is a ton of great cheese left over at the end for visitors to sample! Or to be more exact, close to 33 tons: The Wisconsin State Journal reports that 66,000 pounds of cheese arrived in Madison to be part of the event. In 2016, a home-state competitor took the title of grand champion: Roth Cheese’s Grand Cru Surchoix. 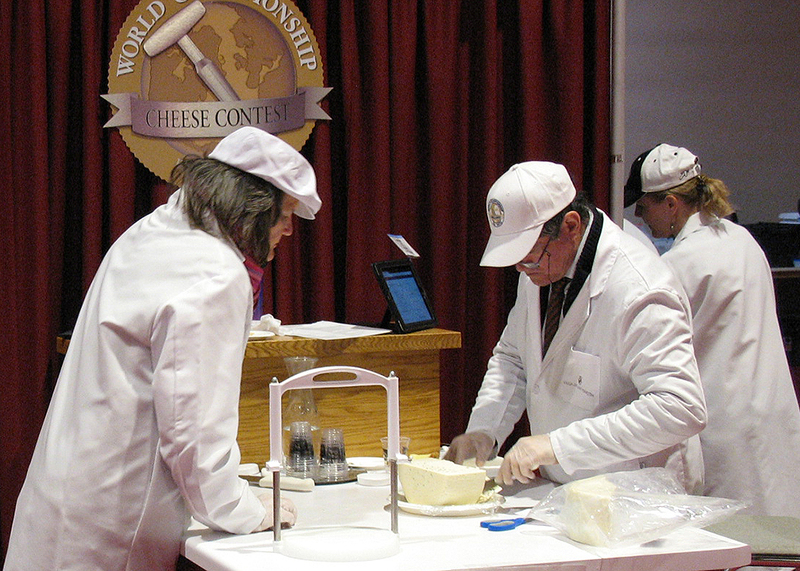 Entries from Wisconsin have won the title 11 times since 1957, but European cheese have dominated in recent years until the last contest. If you want to celebrate the winner, buy a ticket to the gala tomorrow evening – Thursday, March 8 – and see the tables stacked with the best cheeses in the world. It’s an amazing sight…and then you get to taste them too. Just part of the fun of living in America’s Dairyland. ← Best of Madison 2018 Gold!